With the festive season is round the corner, Indian Idol 10 is all set you to take you on a festive mode this weekend with Navratri special episode. Singing diva Richa Sharma have finished shooting for the upcoming Navratri Special episode. She was also joined by Ayushmann Khurrana and director Amit Sharma as they celebrated the festive aura of Navaratri with the top nine contestants. The performance of Richa and Renu stunned the audiences and the judges alike and gave them goosebumps! Richa Sharma shared fond memories and also had an emotional moment as she said that there can be no friend better than Vishal, which made him emotional as well. Salman Ali, the musical prodigy from Haryana, who has been impressing the judges and audiences, also impressed the guests, who made an appearance on the show. Adding to the list of the talented singer’s ever increasing fan base is none other than Ayushmann Khurrana. The actor was amazed by Salman’s version on Jai Mata Di. When he heard Salman Ali singing this song, he revealed that he was transported back to Vaishnodevi. Parineeti and Arjun Kapoor, who came to promote Namaste England on Indian Idol 10 declared Salman Ali as their favorite contestant. One must not miss Parineeti and Arjun Kapoor dancing on their favorite tracks from Ishaqzaade, Parineeti's performance on a number from her upcoming movie with Vishal Dadlani and Arjun Kapoor and some mind blowing duet performances by the top nine contestants. Parineeti Chopra revealed, when she was young and was learning to sing, she always dreamt of going to Indian Idol and sing. This was during season 1, now she feels really great that she can come and sing as many songs on this stage. Neelanjana, who belongs to West Bengal wished to celebrate the Dhak and Dhunachi dance on account on Durga Puja on the show. 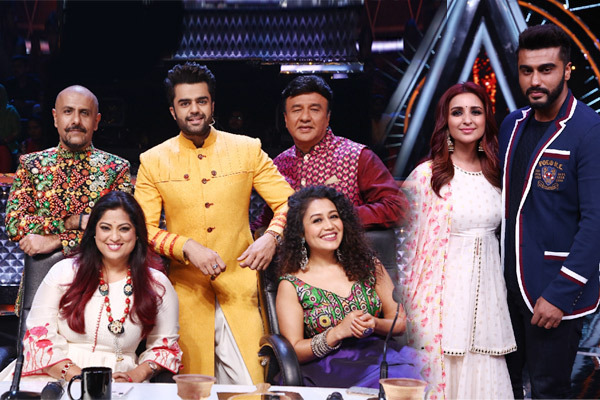 On her request the judges on the show Neha Kakkar, Vishal Dadlani, Anu Malik, host Maniesh Paul and guest Richa Sharma joined her on the stage for the Dhak and Dhunachi dance that astounded everyone. MUMBAI: They ruled reality television as the undisputed leaders of the weekend 9 PM slot all through the show’s gloriously successful eight month run in 2017.